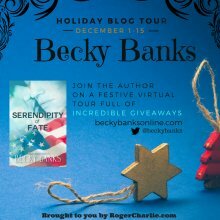 Today we have Becky Banks stopping on over to share her latest book and an awesome contest. Becky has partnered with It's All In the Dee-Tales for a fabulous giveaway. :) That store is located in Portland, OR...My hometown! Don't miss the giveaway below! It’s been two years since Cason McPherson watched his best friend die in his arms. With shrapnel in his hip and a war behind him, he keeps focused on building a civilian life and not on what he wants most: the woman of his dreams, Savannah. Nor the secret he’s keeping from her. Savannah Sparling has no time for baggage, and Cason McPherson brought home a matching set in scathing green and a duffel full of lies. He’s the childhood friend who enlisted with her brother. He came home, and her brother didn’t. Balancing work with demanding clients while fulfilling a personal vendetta against Cason consumes Savannah’s already full schedule—until a series of unstoppable events leads to a collision between Savannah’s work and personal lives. Her carefully structured path in the world is crushed, her own blood is spilled, and passion between her and an unlikely bedfellow ignite. Cason and Savannah find the only the people strong enough to save them from themselves is each other. But will either one of them accept the help—and the love—that’s offered? Savannah stepped from the creamy leather interior of her pearlescent white SUV and hauled out a bag of groceries for her mother. The late Thursday afternoon was like every other toward the end of a New Orleans summer: hot, humid, and downright suffocating. Bumping the car door shut with her hip, Savannah turned toward the house. It was a single-level blue bungalow that blended in with the other nondescript seventies bungalows around it. A postage-stamp front lawn, like the neighbors’, separated it from the road. The various yards’ details, the only apparent means of homeowner expression, ranged from untamed wilderness to fashion gardens to bright-green lawns trimmed to within an inch of their lives with military-like precision. Her mother’s was the latter. Savannah shoved the front door open. “Mama, I’m here,” she said with a soft New Orleans drawl. She knocked the door closed with the sole of her high heel. Having come straight from work, Savannah still wore her designer skirt suit in fashionable black and layered strands of sterling-silver beads. Shoving her sunglasses up onto her head, she carried the groceries through the air-conditioned living room of her childhood home and into the kitchen. She heard her mother’s footsteps down the hall before she emerged into the kitchen, wearing her spectacles and looking down at a crossword puzzle in her hand. Savannah dropped the bag of groceries onto the counter, and the noise got her mother’s attention. Us? Savannah had thought Cason would be moved out by now. Just a year, he had said; then it was another ten months, and then last month he finally had a place lined up. He can’t possibly still be here, Savannah thought. As if on cue, she heard the bathroom door open and the man in question step into the hallway toward the room that had once been her brother’s. Before Ryan was killed in Afghanistan, where he was serving his last tour. Whose death was in part that man’s fault. Each time she watched him walk into Ryan’s room, the one her mama had given to him, she felt the grate of angry betrayal deep in her belly. Now able to see down the wood-paneled hallway, Savannah watched Cason pause in the bedroom doorway at the sound of her voice, his work clothes in his hand. He turned, looking over his shoulder, short sandy-brown hair still wet and spiky from his shower. His gaze went past her mother and made brief eye contact with her. As if acknowledging that, yes, he was still there, and no, he wasn’t going anywhere. She gave him a hot glare back that said that it would be talked about. “Savannah…” Her mother’s tone was disapproving. “I know you weren’t expecting Cason to stay longer,” she said, diving into the thick of it. At the mention of his name, he came to stand in the entry to the hall, silently crossing his arms over his chest. “Your mother asked me to stay.” His voice was low and deep; its masculine tone felt like an intruder in a house that had seen only women for so long. Savannah hated the way his definitiveness felt like law. This contest is sponsored by a third party. The winner's prize will be sent by the sponsor. We are just posting their contest on Night Owl Reviews so our users know of the contest. Prizes are given away by the sponsors and not Night Owl Reviews. The sponsor is solely responsible for the contest prize and shipping. Becky lives in Portland, Oregon, with her husband, Keith, and their wild toddler, Sammy. Contact Becky online at www.beckybanksonline.com for links to Twitter, Instagram, Google+, Goodreads, and more.